Headquarters for candidates and election campaigns, local, state and national Democratic politics, general election information, and issues with political implications. John Kasich is the first Ohio governor since the 1960s to start his term by appointing an all-white cabinet. (And only five are women.) His reason? He couldn't find "qualified candidates." Sound familiar? After an outcry, he has appointed one minority member -- Michael Colbert, who is black -- as director of the Ohio Department of Job and Family Services. But Colbert had previously been serving as interim director of the social welfare agency. When the Ohio Legislative Black Caucus offered to help Kasich diversify his cabinet choices, he told them, "I do n't need your people." His staff later said he meant Democrats, not people of color. What? State Senator Nina Turner (D-District 25, Cleveland) recalls Kasich's rebuff (from the Jan. 31, 2011, Ed Show on MSNBC). She points out that cabinet positions call for administrative skills, not agreement with Kasich's political outlook. And surely there are qualified people of color in Ohio, or in the country, who are experienced administrators. 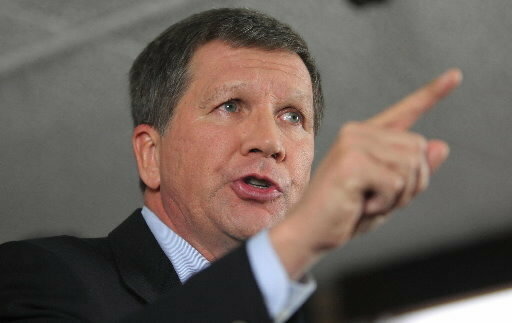 Kasich's stance shows "strong insensitivity," Turner noted. We'll say. After all, Kasich already has skipped a remembrance of Martin Luther King, Jr. -- and issued a proclamation honoring the civil rights leader on St. Patrick's Day. I-Publist.com, "Ohio Governor Says, 'I Don't Need Your People'"
ThinkProgress.com, "Gov. Kasich to Black Lawmaker, 'I Don't Need Your People'"